Clearance Sales are in abundance at this time of year as retailers are desperately wanting to unload their merchandise which they’ve accumulated, and goes unsold during the year. So it becomes a period of wanting to sell off this excess inventory. 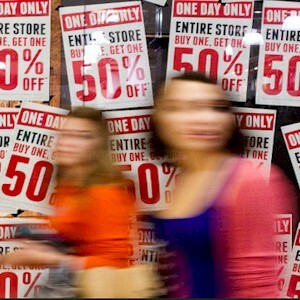 As a result, once the consumers begin seeing the bright red “Everything Must Go” clearance sales, they flock to the stores and will always end up buying things which they don’t need, want, or will ever use. The store’s junk then becomes their junk. These bottom dollar bargain hunter shoppers, as a result, will then end up spending money that they necessarily didn’t want to, by getting lured in by the “Further Reductions” tag. All of this excess inventory is labelled as a limited time deal you can’t refuse, and this for good reason. These huge reductions in prices and the way that they’re presented triggers a primal psychological impulse. So listed are some reasons why the “red hot” sales which any shopper becomes vulnerable to, results in spending more of their hard earned cash. Once you realize what they are, then you’ll begin making wiser buying decisions. All of these sales are generally “one of a kind” clearance sales of unsold accumulated inventory. So in the eyes of the shopper, they realize that once they’re sold, the opportunity to buy that item will be gone forever. What this does is it instills the fear of “missing out” on something that we don’t need, subconsciously, which then activates this extremely powerful emotional trigger to buy. As a result, what we’ll eagerly do is run down to the store to purchase that sweater for 90% percent off, the same one you wouldn’t buy if it wasn’t on sale. This is also true for online purchases as well, as once you see the “limited” merchandise selling out right before your very eyes, the panic buying frenzy buttons are activated. When in an actual store, you can at least physically look and touch the item while considering it’s value. So the best way to avoid this type of impulse buying is to make a list of your most coveted items, and then just buy what you want once it goes on sale. What we fear the most is potentially missing out on something, which is always elevated by knowing that you’re always competing with others. As a result, what’s been created is an entirely new sport, competitive shopping. Buying that best product at the lowest price is the goal, and at times, it’s more important that we actually buy it then owning it. Some happy shopper will declare themselves the winner once they display their multiple purchases during a clearance event. The store will also most likely be completely packed with other shoppers and then there’s always that absolute joy when they’re able to nab merchandise that others surely want. What these large crowds will do is heighten the emotions and the competitive spirit, which completely reduces our ability to think carefully regarding the true worth of whatever we’re buying. So the best solution is time. Take the time to just step away from the excitement of the frenzy, and doing so should reduce the chances of making that poor unsatisfying purchase. What we do is rely on the price tag for any piece of merchandise to understand what its value is. The majority of people don’t understand why one pair of shoes is $150, while another similar pair is $40. So what we do is rely solely on the price of the item as a measurement of quality and style. That’s why the once $200 shoes which are now on sale for $50, seems like a better bargain than the $80 pair which are not on sale. As a result, there are countless numbers of dramatically discounted shoes which are collecting dust and hidden in the closet. The best way to cure this is to look at the clearance sales price as the original price, and then ask yourself if you would buy them. What these “sales” do is it shifts our focus from saving money to wanting to spend money. Most are then shocked that their credit cards are maxed out directly after their annual shopping binges. What they can’t believe is since everything that they bought was on sale, and they saved a lot of money, why then do they owe so much. What these retailers will also do is tap directly into the emotions of the buyer by believing that they’re saving money, by displaying their savings on the receipt. The best and easiest fix for this is by paying with cash. Credit cards are too easy as they act as a buffer placing emphasis on what you’re getting, rather than what they’re spending. Using gift cards can be worse since they feel like free money, but there’s no debt associated with them. Those who are chronic “bargain” shoppers will place pressure on themselves by making sure they don’t leave the store empty handed. So they’ll find something, anything, that they can buy to justify their time. The shopper will storm through the department store, realize that there’s not much left, but will find a piece of clothing that they don’t need for 75% off. So ask yourself if you really need that item or if you’re just caught up in the moment. What these bargain hunters will do is purchase things that they don’t need, but are still satisfied with the thrill of saving money. Also, the rush that they get from saving money can become addictive, making the products they buy secondary. Buying an item that’s coveted can be a blissful experience. Getting that item on sale is better. So getting both is the ultimate shoppers high. So if you can focus yourself better, and plan a bit, then you can also be satisfied with the item on sale.